As I waited for the slow taxi, I realized his speed was actually decreasing, and I braced myself for the conversation that was about to happen. The sun beat down as I walked across town carrying 30 pounds of laundry and laptop on my back, and when the taxi approached I was around the corner from the Laundromat. I just had to cross the street. But the infernal taxi, too close to allow me to cross, yet obnoxiously far away, slowed down and then stopped in front of me, completely blocking my path across the street. I rolled my eyes, but the driver smiled. “Leai, fa’afetai,” No thank you, I told him. “It’s hot,” he said, as though he didn’t hear me. I walked around the back of his cab across the street. 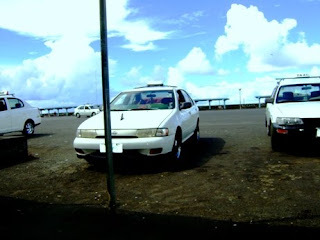 Taxis aren’t regulated tightly in Samoa, and the market is open to anyone who can get their hands on a white car with a little sign on top. 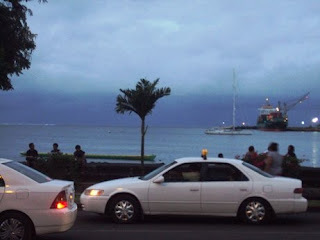 I’m not sure there are official statistics, but if I had to guess, I’d say the ratio of taxis to regular cars in Samoa is nearly 1:1. Many drivers have a home base to station themselves at wait for cars, but others go out and sell themselves. When Blakey and I were walking up the cross island road toward Robert Louis Stevenson’s house, three of them yelled in harmony, “TAXI?” We debated on whether or not they coordinated yelling at the same time. Based on the harmony, we decided they did. “Do he think the option hadn’t occurred to us?” Dan asked rhetorically later on. “Did he think that it was going to be like a lightning flash? Like we’d say, ‘Hey. That’s a great idea.’ Or maybe we had wanted one before he drove up, but we just couldn’t find one.” As though the streets weren’t full of them. I hope you’re spending less on transportation. Pictures below. My backpack on the way home from laundry today was huge. Hard to see, I know. 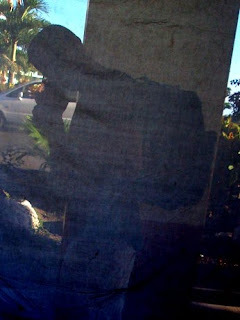 I took a picture of my reflection in a store window. It's the best I could do. 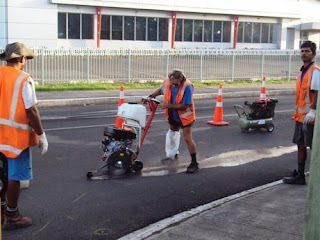 Tearing out the street to put in censors on the left side for the road switch. Same time next week then.